Nobody in politics wants their own party's candidates to lose, especially in the top races. But losing by a little is better than losing by a lot — and not just for pride's sake: It can help down-ballot candidates in close contests. Let us gather together, fellow political buffs, and speculate. You in? 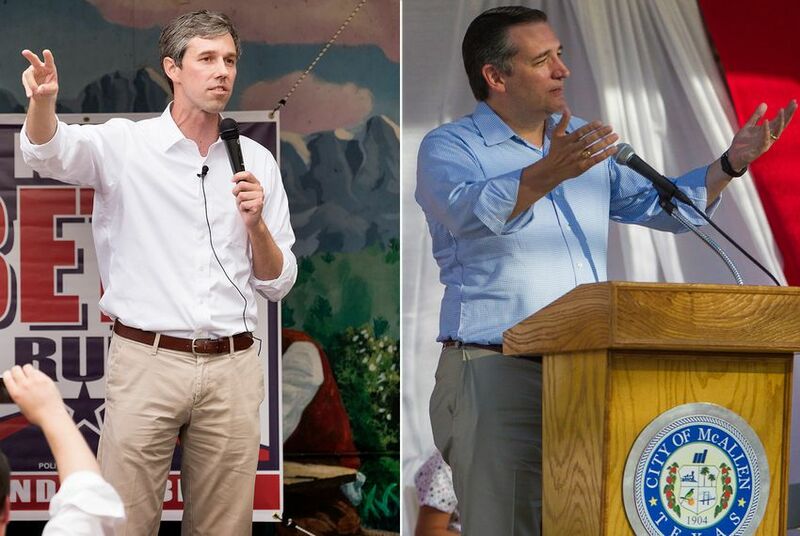 A new poll says Republican Ted Cruz and Democrat Beto O’Rourke are just four percentage points apart in the race for U.S. Senate. It follows a slew of polls with single-digit differences between the incumbent and the challenger — an accumulation of flashing yellow lights that has some Republicans spooked and some Democrats dreaming. The Texas Tribune’s Abby Livingston wrote up the details of the new NBC News/Marist Poll, and the Trib’s Alex Samuels recently caught a netful of Texas polls and asked some experts what they all mean. But this isn’t about the polls. This is about what a close race might mean. Texas is set to ditch its straight-ticket voting option in 2020, but it will still be available to voters this November. In the state’s ten biggest counties, nearly two-thirds of voters cast their ballots by pulling a party lever instead of working their way down the ballot, race by race. That means that a close race at the top of the ballot — the so-called marquee race that voters are paying attention to — could produce a different coattail effect than a landslide would. It’s the “rising tide lifts all boats” idea. If one party gets a landslide in a place, like Texas, with straight-party voting, down-ballot candidates can benefit from their marquee candidate’s performances. But even when the top candidates fall short — if their losses are narrow enough — they can make it rain for the candidates downstream. That happens, to some extent, even in elections when there’s no straight-ticket voting; the parties of many past presidents have suffered losses in mid-term elections like this one because voters wanted to send a message to the fellow in the White House. And gubernatorial races at the top can have a trickle-down. In 1998, George W. Bush buried Democrat Garry Mauro, with 68 percent of the vote to Mauro’s 31 percent. That left at least two statewide Democratic candidates — John Sharp and Paul Hobby — wondering what might have been. Sharp finished 68,731 votes — out of 3.7 million votes cast — behind Rick Perry in the race for lieutenant governor. Hobby’s miss in his bid for comptroller was even smaller; just 20,223 separated him from the winner, Carole Keeton Rylander. What if Bush hadn’t provided that big cushion? Four years earlier, Bush defeated incumbent Ann Richards by fewer than eight percentage points. Democrats won the next five statewide races on the ballot. Republicans have dominated Texas politics ever since, often by big margins. But the polling in this year’s U.S. Senate race encourages speculation. Even if Republicans continue their winning streak, a five-point win could play differently down-ballot than a more typical 20-point win. A Republican congressman in a swing district — Will Hurd of Helotes — or in a district that’s hotly contested — a group that includes Pete Sessions of Dallas, John Culberson of Houston and, perhaps, John Carter of Georgetown — could be jeopardized by the thin air cover from the Senate race. Hurd’s is a true swing district, winnable by candidates from either party. Notably, he’s alone among Republicans in the Texas congressional delegation in putting some daylight between himself and the Trump Administration. He was also half of that Facebook buddy flick with O’Rourke last year, when the two livestreamed a cross-country road trip, talking about politics. If the Senate race one notch above him on the ballot is tight, all of that could be important insulation against Democrat Gina Ortiz Jones and Libertarian Ruben Corvalan. Sessions and Culberson are in different territory, defending historically safe Republican districts against vigorous challenges from well-financed Democrats. Sessions’ opponents are Democrat Colin Allred and Libertarian Melina Baker; Culberson will face Democrat Lizzie Pannill Fletcher in November. The outcomes depend on many variables: who turns out voters, whose ads are more effective, Trump’s popularity and so on. The race above them is another of those. Democrats want O’Rourke to win the top race, of course — they’re Democrats. But if he loses, they at least want a close race. That could create some wins for candidates lower on the ballot — and give political speculators something to talk about.